And here she is looking slightly better still pretty sad in her new home. I'm really psyched that one day she may cover up that stupid white downspout extender that I have yet to address. I already have a stunning 'Wine and Roses' Weigela on the opposite side of the yard, along with three tiny 'My Monet' Weigelas, so this is a welcome addition to the landscape! i've been working in the yard a bit, too, over the last couple of weeks. it's finally starting to cool off a little, and it's such a nice distraction. You have such a gift for landscaping. I love seeing your yard. Annabelle is high maintenance, but who isn't? Your yard is looking great! Ps. Forgot to comment on it but your porch re-do has been on my mind ever since I read it! A few changes just made a huge difference! Your yard is so beautiful! I wish I had a pretty garden like yours. I love hydrangeas, but if they are this high maintenance, maybe I should steer clear. I've never heard of a Weigela, but the Wine and Roses one is a beauty! I love the Weigela!! I had a Hydrangea and I put it in the shade. It was doing awesome and growing a lot, and then all of a sudden half of it died. So weird. Have you thought about spray painting the downspout thing? Maybe a reddish color to blend in with the brick? Just an idea! 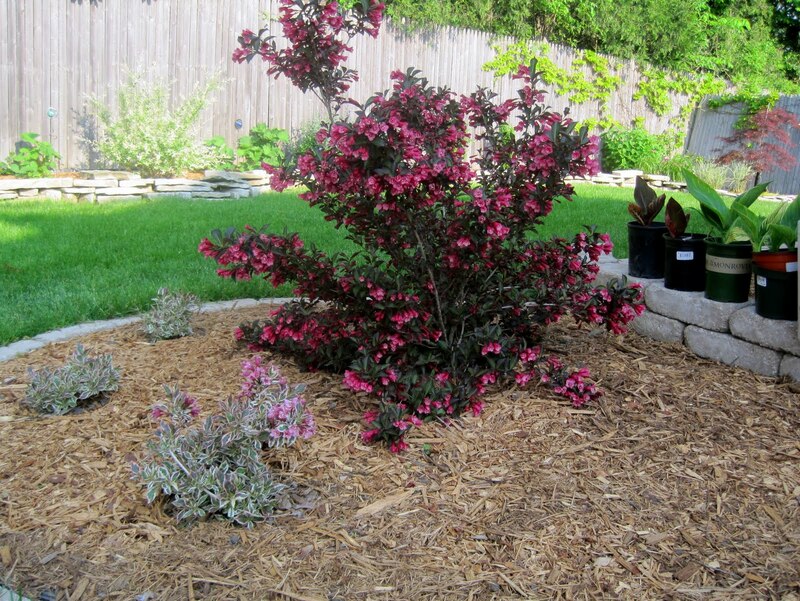 I love weigela! Except ours seems to get eaten by something. Yours looks awesome and I love the little froggy. I've never tried to grow hydrangeas but they sound like a pita.